The Boeing 737 MAX aircraft is Boeing’s newest plane to be released for commercial flight. Boeing makes giant pieces of metal fly in the air for thousands of miles at a time. They are hyper secure, have the upmost concern for safety and a driver for innovation every single day. The pilots have great stories and are extremely knowledgable. They don’t look much up when you ask them a question, they just answer it. I’ve shared the only photo I’m allowed to show. 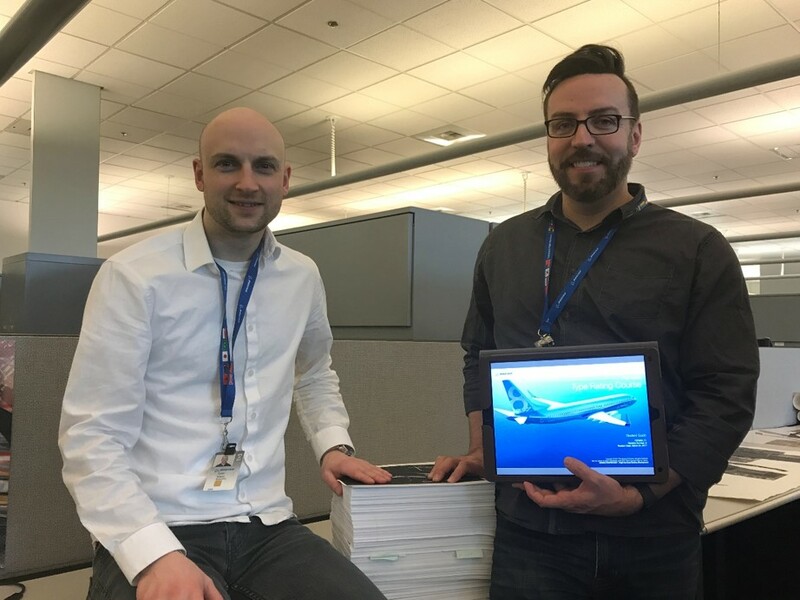 That’s Craig Clark and I next to the physical pages we turned into a digital interactive training manual. Designer & Editor – I was responsible for developing a way to open HTML5 content in iBooks in a way that worked perfectly and was easy to learn. I then took content written by SMEs and translated it into templates built in InDesign. Finally I developed processes for publishing the book and loading it onto iPads. We were inventors. What we accomplished, simply had never been done before. At Boeing I pushed myself harder than ever in creating a piece of software that broke new ground. There was no referencing the internet when it came to our challenges in research and development because no one had answers for us. The book was giant, filled with over 2000 procedures and schematics of every operations system on the airplane. We had to hack our way through Adobe’s Creative Cloud and iBooks in ways no forum on the internet could explain. I failed more in 13 months than I have in my entire life. But I learned more about process development and workflow than any other project I’ve been on. Utilize a secure and reliable e-book reader to display a massive interactive training manual. The manual will be used both in the classroom and at hotels where the pilots in training stay in-between classes. Trainees need to be able to easily navigate the manuals’ 81 chapters and quiz themselves on material they expect to train on the following day. Though it wasn’t part of our deliverable, the hidden challenge within this project was creating processes (usually through scripts and work arounds) to modify such a massive and dynamic ebook. There isn’t enough RAM and software capability in the world to run all of our processes at the same time. So we broke down the tasks and created a process to run them in. Each and every time we needed to publish the manual was like launching a rocket. In order to offset some of the delicate work of publishing, the challenge then evolved into planning when and how we made changes to the manual. Choosing iBooks to open our ePub was contingent on our ability to somehow force it to open our interactive HTML5 content, which was built in Adobe Captivate. iBooks doesn’t allow any content besides text and video to be opened inside the application. However we knew that iBooks was the most secure and we had more control over the ePub than with other readers. So we actually didn’t have a choice, we had to get iBooks and our ePub to play nicely. After months of learning the back end of iBooks and the code that InDesign spits out as an ePub, we had failed over and over again. It wasn’t looking bright for us and moral was pretty low on this front. There was a work around, but it involved remaking thousands of hours of content which from a financial standpoint was of course not even being considered. While I can’t show you the code I wrote to eventually hack iBooks into opening and closing our content, this accomplishment slingshotted us into the next phase of the project, injecting the interactive pieces and publishing the book. Not being able to rely on the internet to give me answers was an empowering experience.